The African Leaders Malaria Alliance (ALMA) on 29 January 2016 presented Botswana with the 2016 Award for Excellence in recognition of the country’s progress in fighting malaria and meeting the Millennium Development Goals (MDGs) target for malaria reduction. Township Rollers of Botswana made history on 17 March 2018 as they became the first club from Botswana to reach the group phase of the African Champions Football League. The Interpol Environmental Crime Programme presented wildlife crime law enforcement representatives from Botswana with the Interpol Ecomessage Award on 17 March 2010 for their outstanding efforts in combating international wildlife crime and significant contribution to the international exchange of intelligence relating to environmental criminals. Botswana was named as the fourth most attractive investment destination in Africa, according to the Africa Investment Index 2018 published by Quantum Global Research Lab. Malebogo Molefhe of Botswana, a survivor of domestic violence and former National Basketball player, was honoured with the United States Secretary of State’s International Women of Courage Award 2017. Sprinter Isaac Makwala of Botswana won gold in Men's 400m at the 2018 Commonwealth Games in Australia. Sprinter Amantle Montsho of Botswana won gold in Women's 400m at the 2018 Commonwealth Games in Australia. Maclean Letshwiti of Botswana was elected as a member of Fifa's Disciplinary Committee from Africa on 11 May 2017. Botswana and 25 other nations from Africa on 10 June 2015 signed a historic free trade pact, Tripartite Free Trade Area (TFTA), that will ease the movement of goods across member countries in next five years. Once fully implemented, the 26-nation TFTA will be the continent's largest free-trade zone. Botswana's Okavango Delta, comprises permanent marshlands and seasonally flooded plains, was inscribed in the United Nations Educational, Scientific and Cultural Organization (UNESCO)’s World Heritage List on 22 June 2014. The delta became the 1000th site inscribed on the World Heritage List. Chaikhwa Lobatse of Botswana received the 2017 Queen’s Young Leaders Award for her commitment to use her own experience of cancer to help improve the lives of others. Nijel Amos of Botswana won gold in the men's 800m race at the 2014 Commonwealth Games in Glasgow. Botswana and South Africa have signed three cooperation agreements during a two-day state visit by South African President Jacob Zuma in Botswana from 29 to 30 August 2012 in order to further enhance the excellent bilateral relations and cooperation between the two countries. 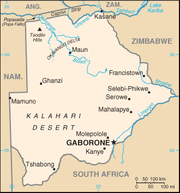 Botswana was admitted as a member of the United Nations (UN) on 17 October 1966. Botswana's former President Festus Mogae was awarded the 2008 Ibrahim Prize for Achievement in African Leadership on 19 October 2008 for his leadership and actions to tackle the AIDS pandemic. The Ibrahim prize which celebrates excellence in African leadership was awarded by London based Mo Ibrahim Foundation. Botswanan pottery-making tradition is inscribed on the UN Educational, Scientific and Cultural Organization (UNESCO) List of Intangible Cultural Heritage on 4 December 2012 – part of the world body’s ongoing efforts to preserve endangered practices from fading into extinction. Queen Baboloki of Botswana was awarded the 2015 Future Awards Africa Prize in Advocacy & Activism category at the prestigious Intercontinental Hotels, Victoria Island, Lagos. This page was last edited on 15 April 2019, at 10:00.